Rex Ryan announced that Greg McElroy was being evaluated for a possible concussion and won't play Sunday against the Buffalo Bills in the season finale. Bypassing Tim Tebow for the second time in as many weeks, Ryan said Mark Sanchez will start the game — yet another blow to Tebow, who has complained openly about his lack of opportunities this season. On Thursday morning, McElroy developed a severe headache while lifting weights. McElroy, wearing a towel around his head, told trainer John Mellody of the symptoms. Together, they walked into Ryan's office around 9:30 to break the news. Yes, this whole thing is about as Jets as it gets. 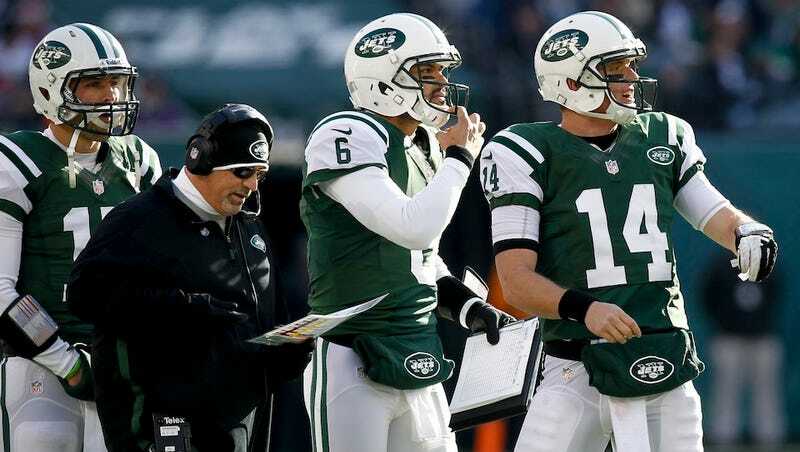 A starting quarterback's concussion will not work the same magic for the Jets that it did for the Niners. Mercifully, Sunday's game against Buffalo is blacked out upstate, while other CBS affiliates in New York and Connecticut have decided to carry Houston-Indianapolis. Perhaps no one will have to see what actually unfolds.